Raise your hand if you've been pre-rinsing your dirty dishes before loading them into the dishwasher for as long as you can remember. Anyone? Same here. Apparently, we've been wrong all along. 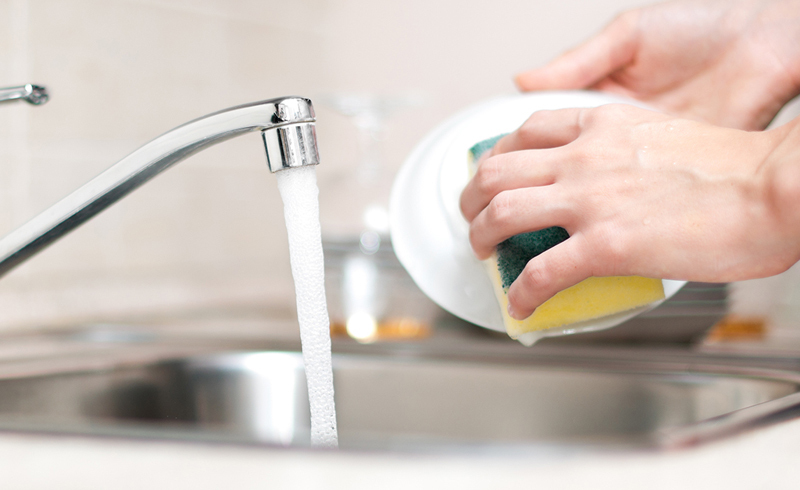 In fact, the director of the Cleaning Lab at the Good Housekeeping Institute, Carolyn Forte, notes several reasons not to put dirty dishes under the faucet before running them through the dishwasher. Let's start with the most convincing case against pre-rinsing. As the Wall Street Journal explains, "enzymes in Cascade detergent are designed to attach themselves to food particles. Without food, the enzymes have nothing to latch on to." In other words, some detergents won't actually clean your dishes if you pre-rinse them, which defeats the very purpose of a dishwasher. You can (and should) still scrape off any large food scraps, though. Aside from wanting to clean our dishes effectively, there are also environmental reports that might further convince you to put down your sponges and step away from the sink. The National Resource Defense Council reports that one of the easiest ways to save water and energy is by opting for a dishwasher and refraining from pre-rinsing dishes. And this tiny lifestyle change makes a huge impact, as hand-washing dishes requires about 27 gallons of water per load while an energy efficient dishwasher only uses 3 gallons of water per load. This is all actually great news. Without having to pre-rinse dishes, we'll be saving our own time and energy, too. It's a win-win.